There has been a long-standing dogma within the scientific community that scientists can not, and should not, be activists. “To be effective,” my undergraduate mentor told me, “scientists need to be impartial, they need to do science and let others worry about the advocacy. If you want to go into advocacy, that’s great, but you have to choose that route or choose science.” As 120 heads of state met at a critical United Nations Climate Summit in New York last month, this dogma has never been clearly more out-dated and indeed, in need of “major revision." 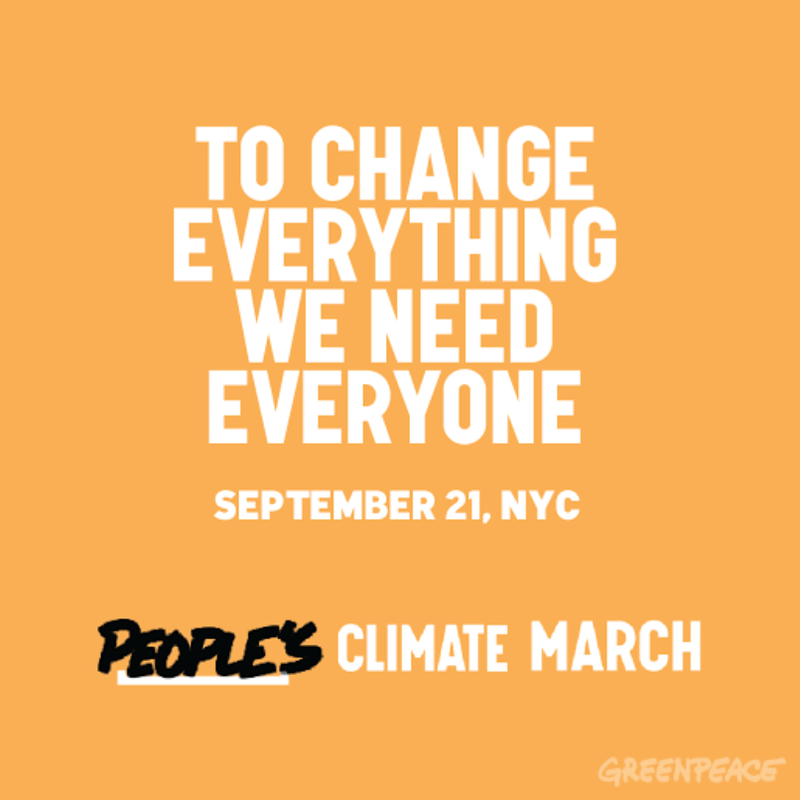 On September 21st, more than 2,500 independent mobilization events were held in cities (including Montreal) across 160 countries around the world in what was collectively called the Peoples’ Climate Mobilization. The mission was this: to demand that the heads of state representing governments around the world make tangible commitments to work together to solve the climate crisis. Given the increasingly dire predictions of the international scientific community, including the Inter-governmental Panel on Climate Change, there has never been a more urgent time for action to reduce greenhouse gas emissions, especially from the largest per capita carbon polluters in the world, which include the United States and Canada. 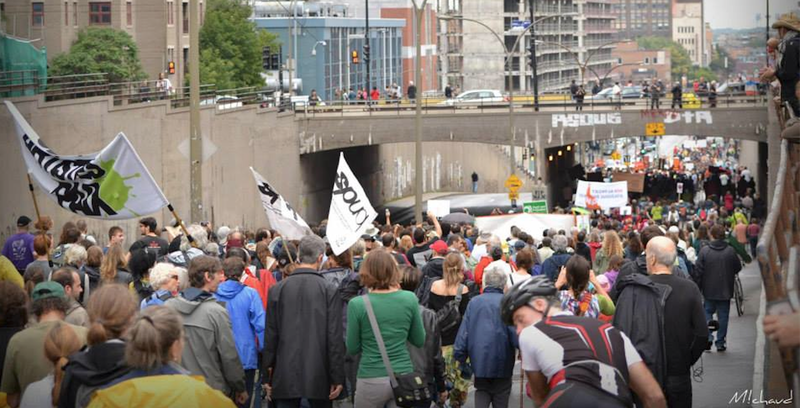 People's Climate Mobilization in Montreal! In order to make these momentous changes, not only in global climate policy, but also in environmental conservation and natural resource management, an informed public needs to have access to and understand science. It does not take a scientifically literate populace to see that dramatic climate changes is already taking place, but it does take scientific literacy to understand the potential consequences of increasing levels of carbon in the atmosphere and to recognize that human activities are driving these changes. However, the science that is essential to inform the public, and the scientists that provide this information, are under attack. Indeed, in Canada as well as the United States, there is a war on science on several fronts. 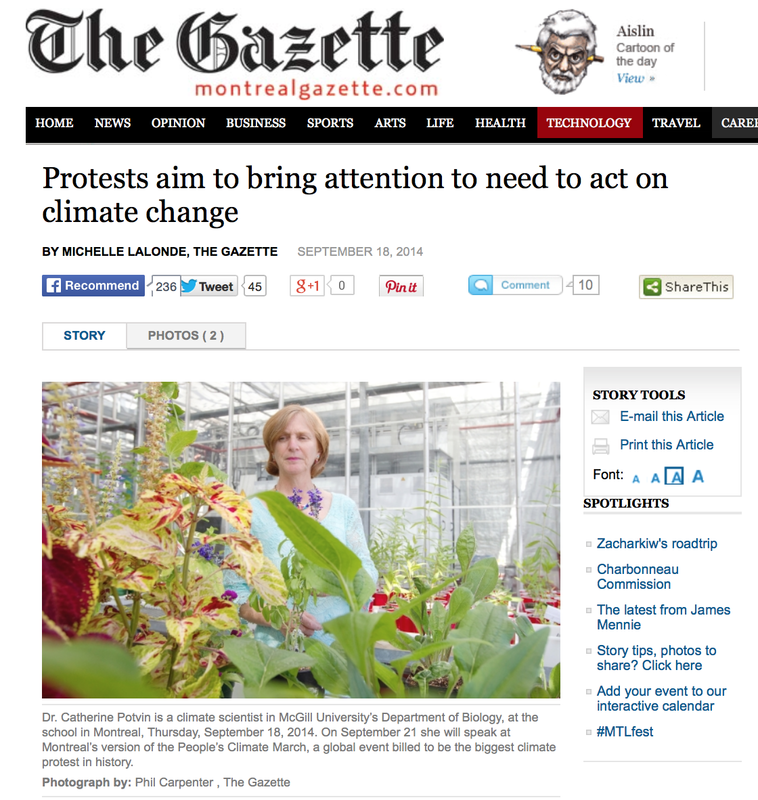 Founding director of McGill's Neotropical Environment (NEO) Program, Dr. Catherine Potion. Professor Potvin is the Canada Research Chair in Climate Change Mitigation and Tropical Forests and a UN Framework Convention on Climate Change negotiator for Panama and special advisor to Indigenous communities. She spoke at the protest, and I had the pleasure to march beside her (a hip, hip lady). 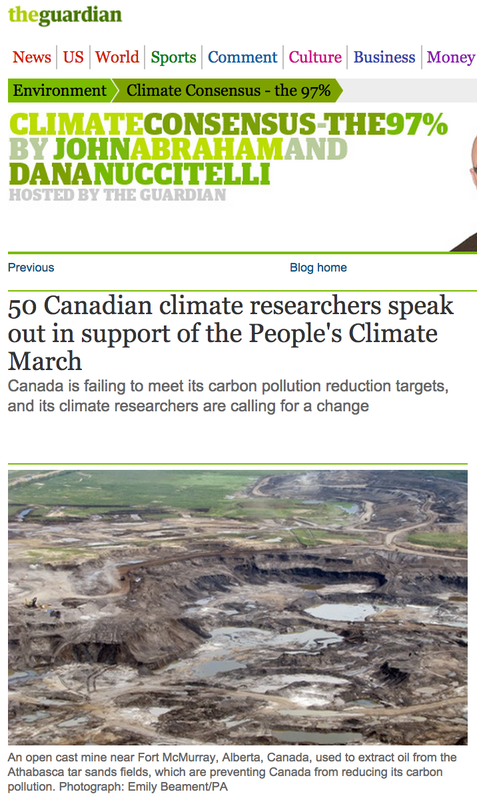 Several well-documented examples have now been made public that demonstrate a directed political agenda to undermine research on climate change and other environmental issues in North America. The first example is of the control of scientific information through the muzzling of government scientists working for Environment Canada. Under a directive put in place in 2007, scientists are required to have permission from several government agencies to be interviewed by the media and in some cases, need written approval for answers to journalists’ questions regarding the findings of peer-reviewed research. The result, according to a leaked internal policy review at Environment Canada, was an 80% decline in media coverage on climate science (1,2) and perhaps more importantly, a mis-informed public on critically important environmental issues, such as depleting fish stocks (3), ozone-layer depletion (4) and other major environmental issues. This war on science has not only made the science less available to the media and thus the general public, but has also made the access to the data much more difficult for scientists to obtain through systematic budget cuts to research. These budget cuts have sliced their way through scientific research through 1. termination of employment for thousands of scientists working for Environment Canada (5) and the Department of Fisheries and Oceans (6), 2. closure of the Polar Environment Atmosphere Research Laboratory (PEARL), a failure to renew funding for the Canadian Foundation for Climate and Atmospheric Studies in 2011, and massive budget cuts to the Experimental Lakes Area, a vital program for long-term research that has been instrumental for discovering processes such as acid rain and eutrophication that elucidate the impacts of industrial processes on freshwater resources and aquatic ecosystems around the world (7). Clearly, there is a war being waged on both science and scientists (so far I have focused on Canada because I live and study in Montreal, but this war on science has been widely documented in the United States as well… In fact, it took me two minutes to find important examples in the US on the war on science from the federal government on basic research and climate science (11-12), and examples of Congress’ own Science and Technology committee’s war on science policy, specifically the autonomy and impartiality of the peer-review grant approval processes of the National Science Foundation (13) and more recent news on the committee’s war on climate science (14). This is a very real war on science and it has gotten personal for scientists. Remember the bogus “Climategate controversy” concerning the Climatic Research Unit email on statistical transformations that were taken as tweaking the numbers? What you may not remember was that this hacking incident and subsequent media frenzy that made the scientists look like the criminals rather than the victims, was just weeks before the UN climate change negotiations in Copenhagen? ), the question remains… What are we to do? How can we stand by, aloft in our “Ivory Tower,” when there is a war raging below to burry us, our science and with it, the truth? In my view, scientists need to speak out about our science, and we need to stick up for ourselves and for each other. In my opinion, the world is not a playground full of schoolyard bullies. The world is a place where very powerful people, with vested interests and enormous concentrations of wealth and power attained by the wanton pillaging of natural resources, will subvert any and all efforts that they perceive will destabilize their position. When these activities not only endanger local communities but also reach the point where they affect the Earth’s life-support systems, an informed public needs to act. 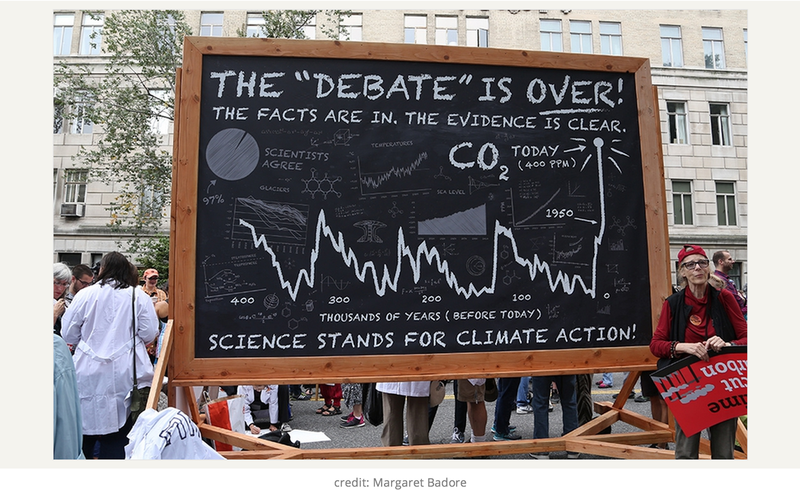 In order to inform the public, scientists need to know the facts and sound the alarm. When the alarm is silenced, scientists need to put ourselves out there, to respond. Louder. On a personal level, I was thrilled at the chance to march in New York City and be a part of an historic event. 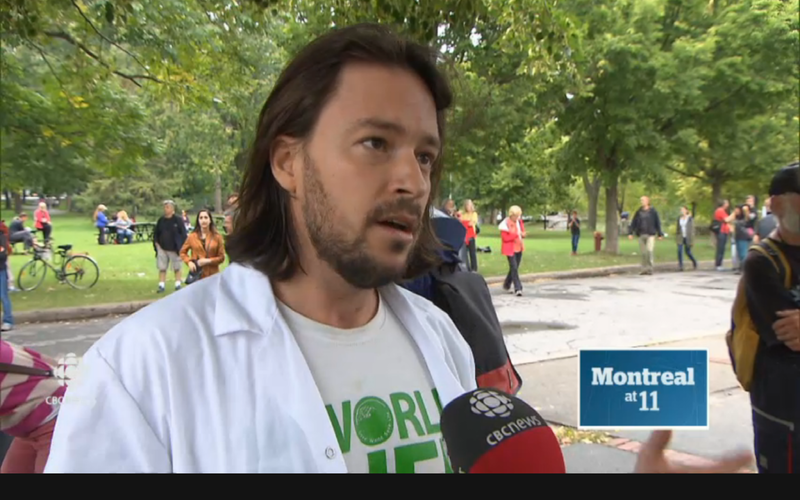 However, I decided to organize locally and join the mobilization effort in Canada, which has a tragic recent record on environmental issues and an alarming agenda against science. To add insult to injury, the Prime Minister of Canada, Stephen Harper, did not attend the UN Climate Summit even though he was in New York City, rolling through photo opportunities in an attempt to save face. Nice try, Stephen. But in effect, this attempt to save face and launch a public relations blitz (that highlights commitment to science and leadership in addressing climate change (15)…. WHAT!?!?!?!?!?!) demonstrates that he knows that people were paying attention, that Canadian citizens are alarmed and embarrassed at his lack of leadership. 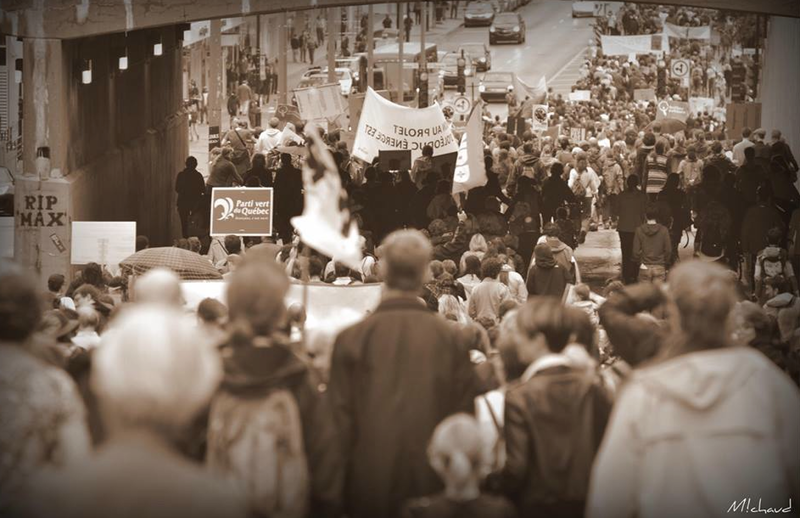 In an effort to help with the mobilization effort in Montreal, I felt it was most effective for me to mobilize the academic community in Montreal and help to ensure that students, as well as faculty, were involved in the mobilization effort. In any social movement, students have always played a central role, be it in the Independence Movement in India, the Civil Rights and Anti-War Movements in the United States and the Anti-Apartheid Movement in South Africa. In the mobilization effort on climate change, it is also imperative to involve scientists as these men and women can be, and should be, the most informed and thus most powerful advocates for the reality of climate change and the role of human society as the major driver for unprecedented rates of changes in climate. Multi-tasking scientists: representing at march as they educate in NYC. They are so rad! So, to make that change, will you continue to mobilize with us, and march again when we have to?